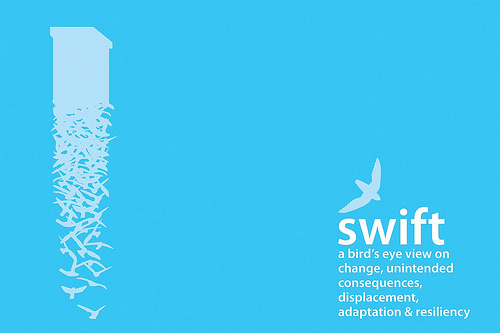 DodoLab’s Swift Project focused on the plight of the endangered chimney swift. The chimney swift is a small grey bird you can often see flitting through the evening skies of Guelph, catching insects. When increasing industry began to erase the hollow tree trunks it originally nested in, it found new homes in the masonry chimneys brought into the landscape by the same force that destroyed their original habitat. In the first component of the project, DodoLab raised awareness about the chimney swift through an campaign featuring swift iconography in Guelph’s downtown core, which was the focus of Musagetes’ 1mile2 initiative. The collective invited passersby to join them in completing a graphic of a large chimney in St. George’s Square by stencilling hundreds of the chimney swift’s iconic silhouette. The painted birds quickly filled the chimney and spilled out onto the sidewalks of downtown. DodoLab created a limited edition series of postcards featuring a bird’s eye view of Guelph,with the a narration about change and resilience as it might be told by the swifts themselves on the other side. These postcards, along with a collection of stencils, bookmarks, t-shirts and buttons, accompanied the intervention. The case of the chimney swift is an opportunity to consider both the bird and broader issues within the Guelph community. This project initiates an inter-species dialogue about adaptation, displacement, and the unintended consequences of change. Change can be swift (with great speed), requiring a response that is swift (as in prompt) and that is equally swift (as in clever), a very rare and complex sequence of conditions. Musagetes believes that art and culture instrumental in building resilient communities. They can help us creatively adapt to constantly changing conditions.